Watch out, Kindle. Here comes Nook. Barnes & Noble, the Internet's largest bookstore, now has its own eBook reader, which can put more than 1 million titles at your disposal and comes with 2 GB (expandable to 16 GB via microSD) of onboard storage. 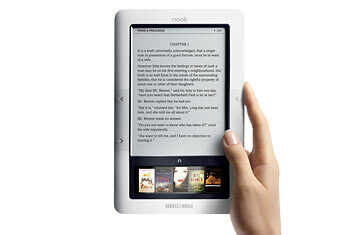 What sets the Nook apart from all other e-readers is a 3.5-in. color touchscreen LCD that resides below the 6-in. E Ink display. The lower touchscreen allows you to browse your entire library without having to leave the page you're currently reading. E-books can be downloaded via wi-fi or AT&T's 3G wireless service that comes free with the Nook. That wi-fi capability is an advantage over Kindle because it enables you to easily download books while traveling overseas. Also, Nook owners have access to free wi-fi in any Barnes & Noble.